Quintess added a boat to its collection of residences earlier this year, and during its recent trip to Boston we went down to the harbor to meet the Captain, Jamie Van Pelt. Jamie grew up sailing in Connecticut and has been a professional captain for 8 years. He's been with Quintess since the destination club bought the Lady Quintess. The Lady Quintess had come up to Boston to start her summer season based in Hyannis on Cape Cod. On the way she had stopped in Annapolis and New York. The New York and Boston ports of call were just 3 day stops each, and on each of these stops she was hosting potential members and current members - an interesting way to give folks a feel for the club, (one of) its residences and its hospitality. While based in Hyannis, members could take her out to Martha's Vineyard, Nantucket, Newport, Rhode Island, and any other places they would like to visit. On September 12th she's going back to be based in Annapolis for a month, and then will be back in her home base of Sunset Harbor Yacht Club, Miami in November through May, with maybe a few weeks in the Bahamas. Her overall schedule is planned out like this well in advance in order to make sure that she has a birth at the marinas she visits. When members book her, they can choose the locations they would like to sail to from her base port. - Or even as far as the Dry Tortugas, off the end of the Florida Keys. With a full time crew of two, members of Quintess are well looked after during their vacations onboard. The crew makes breakfast and lunch, which are all included, as are all non-alcoholic drinks, so members just need to decide on their dinner plans, and as always can get recommendations from the crew or their Quintess concierge. There are various toys on board including eight sets of snorkeling gear and fishing poles, plus a tender for trips ashore in more remote locations. Jamie is looking at getting scuba tanks and a beginner sailboard. The main social areas onboard include the flybridge, diving deck and main cabin and bar, for a fuller description see our earlier article. As with most of the other destination clubs with yachts, members pay a premium for using the Lady Quintess, over and above the clubs regular annual dues. In addition members pay for fuel costs, which at the moment are running close to $5 per gallon. As a guide she uses about 2 gallons per mile, or 60-80 gallons per hour for both engines at cruising speed. If you choose to stay overnight in a different port then there may also be port fees. The incremental fees cover the additional depreciation and maintenance costs for a boat, but they also mean that members have two full time staff for their vacation. The boat also has a dedicated shore based boat manager who looks after all the logistics, bookings and maintenance. Quintess members can book the Lady Quintess from Monday-Thursday and/or Friday-Monday. When we met with Jamie he noted that the summer was pretty well booked with just a few periods available, and Quintess was already thinking about having a second boat. 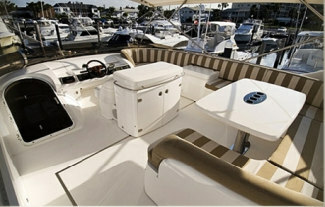 Yachts are becoming increasingly popular amongst the destination clubs. The anecdotal feedback is that many members seem to really like them. They clearly provide that seaborne spirit of adventure, and also let the clubs offer accommodation in places like Nantucket and Martha's Vineyard - locations where they wouldn't tend to buy homes because the season is too short. As we noted above, members pay a premium for using the boats, but in return have an attentive full time crew, usually including a captain and chef and maybe a steward/stewardess. Distinctive Holiday Homes have two yachts in the Mediterranean and are adding another to be based in Miami. Their overall plan is to have about 15% of their residences as boats. Solstice I follows a somewhat similar pattern to the Lady Quintess, with winters in the Bahamas and summers based out of Massachusetts. A&K Residence Club are planning to add an 80ft yacht to be based in St Martin in the winter and Newport, Rhode Island in the summer. Ultimate Escapes has an 80ft yacht, La Buscadora, based in the British Virgin Islands. While Exclusive Resorts doesn't have a yacht they do have 5 residences on "The World", a residential cruise ship that circumnavigates the globe. And we know of at least one other club that is at least considering adding a yacht.